Join us at Vox Populi on Friday, December 7 from 6-10pm for our First Friday’s Reception celebrating our current exhibitions by guest artists Cameron Granger and Gina Siepel, as well as the group exhibition Knew Member Show, featuring the work of seven artists who joined the Vox Populi collective in 2018: Marion Horowitz, Natalie Kuenzi, Kris Rumman, Makeba Rainey, Aaron Terry, Loraine Wible and Luxin Zhang! This month we will be featuring a performance by Knew Member Show artists Luxin Zhang (beginning at 7:30pm) and Marion Horowitz (beginning at 8pm), as well as guest artist Gina Siepel performing Cycles of Self-Determination from 7-9pm. At 7:30pm – Luxin Zhang will activate her 2-channel video installation in Black Box (One Applause/One Voice, Yi Sheng / Yi Sheng) during a performance incorporating movement and live singing. At 8pm – with a lot of magic and a little help from her friends, artist Marion Horowitz will attempt the impossible: she will animate the dead. Bear witness as Marion brings the installation welcome: a golem for me to life, deliver your commands, and save the world. 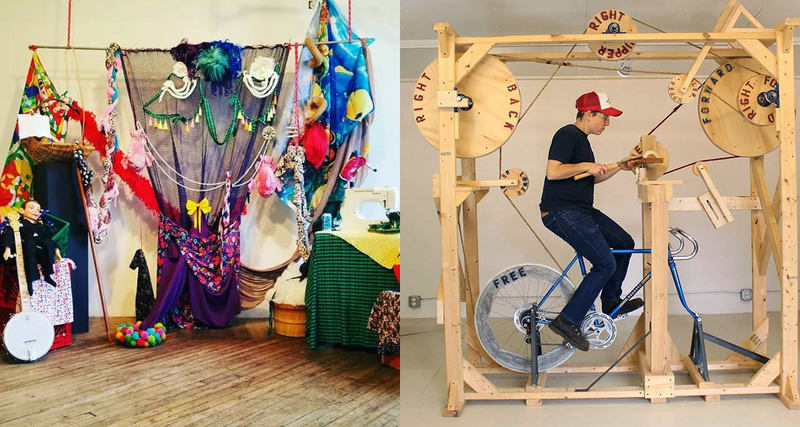 From 7-9pm – in a durational performance, Gina Siepel will activate her sculpture entitled Cycle of Self-Determination, a fully-functional sculptural pedal-powered woodworking lathe. Siepel will be fabricating “continuous profile self portraits” over the duration of the performance. Siepel will also be re-performing this piece on Saturday, December 8 from 3-5pm.